Just out this month is Madeline’s Halloween & Other Spooky Tales on DVD. I popped it in for the kids to watch and I thought it was a little bit on the scary side. However, the kids did not. In fact, they wanted to watch it over and over again. There were five different tales making this a decent length for a children’s DVD. I mean, play one turn it off and play another one on a different day. The titles were, Madeline’s Halloween; Madeline and the Mean, Nasty Horrible Hats; Madeline and the Mummy; Madeline and the Haunted Castle; and Madeline and the Spider Lady. Each one is inspired by the book series Madeline, the story of a dozen little girls who line in an old house in Paris. They go around the city with their keeper and each other trying to keep Madeline out of trouble. I think that my favorite out of the five was Madeline and the Mummy. There was a group of girls on the trip with them that were not nice, so they ran ahead of the 12 girls and hid themselves in the Egyptian pyramid. Then as the 12 girls went in they found all of these scary things and the tomb was moving so they all ran out screaming. Well, Madeline wanted to determine what was going on, and find the missing girls. Then only did they discover that the girls were the cause of the moving tomb and they needed help getting out. Leave a comment telling me your favorite scary story. This giveaway ends September 13th, I have been offered a bouquet to send to a friend. All rules can be found under giveaway rules. She’s captured millions of hearts and been adored by every generation — now Madeline stars in her first animated feature! 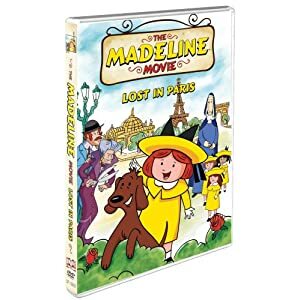 Inspired by the beloved classic books that introduced us to a dozen delightful girls who live in an old house in Paris covered with vines, The Madeline Movie: Lost In Paris is full of spirited fun and five "fantastique" new songs. When a long-lost uncle from Vienna pays a surprise visit, Madeline’s dreams of family life seem wonderfully fulfilled — until she finds herself in the middle of an unfortunate scheme. Madeline then must call upon all of her courage and cleverness to foil an evil plot to take her from the only family she’s ever known. Join Madeline, Miss Clavel, Pepito, 11 school friends, and her ever-so-smart dog, Genevieve, in a thrilling Paris adventure you won’t want to miss, where everyone learns the true meaning of family! My kids prefer Ben 10 over Madeline, not sure why, maybe it’s because of all the action and colors in Ben 10; but they still watch it and ask me what is going on. Madeline is the story of a girl that is living with a bunch of other girls dreams of having a family. Then all the sudden her lone lost uncles shows up. It’s a story I recognize but placed into a cartoon. This uncle tricks Madeline into coming with him and then reveals that he is not really her uncle and dumps her off to do work for a nasty woman who treats children as slaves. Miss Clavels discovers the plot and finds Madeline and reunites her with all of the other girls. Her friends, Her family. It’s a very cute story of love and friendship. I liked it and I hope that you will too. When did you first learn about Madeline?